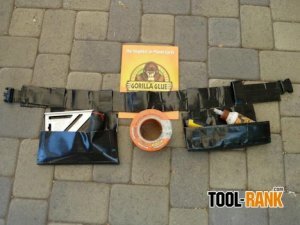 Tool Blog News Gorilla Tape, The Strongest Tool Belt On Planet Earth? What is a good way to make sure we write about your product? Well, sending out a fully functional tool belt made out of Gorilla Glue brand Gorilla Tape sure helps. To be honest, I am a huge fan of Gorilla wood glue and choose it over other brands whenever I can. I like the fact that it is a little thicker and does not run, and it holds strong as would be expected. That being said, I have not used most of the other Gorilla Glue products, such as their epoxies or or tapes. Making a tool belt out of Gorilla Tape is cool enough, but the fact that they made me one and sent it out, takes it up a level. The Gorilla Tape tool belt shows us some of the fun things that can be done with the tape, and awakens my imagination to what else can be made. So what makes Gorilla Tape better than the other duct tapes on the market today? Gorilla Tape sent me out a sample to try out, so I will be able to let you know what I find later down the road, but until then, we have their impressive specs to look at. According to Gorilla Glue, their tape uses an adhesive that is not only stronger than the competition, but also thicker. This extra strength and gap filling thickness allows their tape to stick to everything from stucco, brick, concrete, and wood. Also contributing to the strength of Gorilla Tape is their reinforced backing with a higher thread count, and an all-weather shell that blocks against moisture and holds strong under extreme temperatures and UV rays. Gorilla Tape is offered in 1-inch, 2-inch or 3-inch sizes, and is available in most hardware stores. Prices range from around $5 to $15 per roll depending on size and length.